This turns out very tender. Cut up the lemon into slices and place them and garlic cloves in the cavity of the salmon. 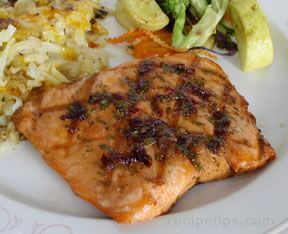 wrap the salmon with tin foil and place on the barbeque or in the oven on a cookie sheet for 25-30 minutes at 350 degrees. When finished baking, peel off the skin from one side and lift the salmon off the bones. It should lift off in pieces very easy. Then you lift the bones out and do the other side.